Will the Ascend G700 be Huawei's next device? Huawei's had a busy 2013 so far, and with the recent launch of the Ascend Mate in China, it looked like the company may lay off the pedal a bit. However, according to @evleaks, that frequent spoiler of secret mobile devices, Huawei may be readying the launch of a new smartphone in its G-series line. Press shots of what @evleaks said is the Ascend G700 appeared online this afternoon, along with a reference to the supposed specifications of the smartphone from another fact finder, @paopao0128. Though not all of the G700's details have been sorted out, there are certainly enough specs to create a pretty solid picture of what the device will be if and when it arrives. According to @paopao0128, the G700 will run Android 4.2: Jelly Bean, and use a quad-core MediaTek MT6589 processor. 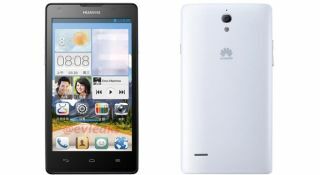 Both the Ascend Mate and Ascend D2 use a quad-core Huawei HiSilicon K3V2 chip, but also use the most recent Android OS. Another leak on the G700's specs from Sina Weibo indicated the phone will have a 5-inch LCD HD display (though probably not higher than 720p resolution), and include 2GB of RAM. Neither of the sources indicated anything about a price or release date, though Sina Weibo did point out previous G-series phones were priced below ¥2,000 (US$321, UK£212, AU$308). Compared to the Ascend D2's ¥3990 (US$642, UK£423, AU$614), that's a pretty significant savings for a device with comparable stats. Until Huawei announces the G700 though, we'll just have to take the word of some reliable sources that a new model is likely on the way.